On 3rd September 2009, both the Straits Times and the Malaysian Insider carried the article ‘Proud To Be Malay Singaporean’. Written by Khartini Khalid, the article addresses among many things a statement made by former Malaysian Information Minister Datuk Zainuddin Maidin in the newspaper Utusan Malaysia. This statement isn’t really about Singapore but a variation of the spooky ethno-nationalist warning against minorities who question the notion of Malay supremacy (as enshrined in Article 153 of the Malaysian Federal Constitution). Malaysian Home Affairs Minister Hishamuddin Hussein might wave a keris to make this point. Another politician might raise the spectre of the May 13 Incident. I can’t speculate on her daily roaming radius, but I suspect that she was trying to say that she was staying in an ethnically homogenous village. According to her, there was a Chinese village ‘across the street’, while the Indians lived in ‘yet another village near some plantations’. There are a few things seriously wrong with extrapolating the writer’s experiences in a remote village in Negeri Sembilan to the multicultural reality of Malaysia. First of all, I’m pretty confident that if she were to stay in a block of apartments in urban Kuala Lumpur, she would be able to visually feast on ‘Truly Asia’. Secondly, what separated the Malay and Chinese villages was a street, not a wall. These villages were not garrisoned ghettoes. Just because they were spatially segregated does not mean that there was zero interaction between the communities. Conversely, just because I have neighbours of various races along a common corridor does not mean that any meaningful interaction occurs among us. One should not confuse the façade of multiculturalism with its substance. It’s unwise to make such judgments without understanding the real complexities in the society that one is so eager to denigrate. This is the kind of attitude that has earned Singaporeans a reputation for arrogance. Wave our flag by all means, but make sure that we don’t hit other people’s faces with it. 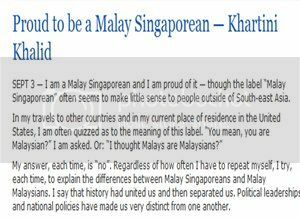 The generalisation that Khartini makes is that Singapore’s multiculturalism is somewhat superior to that of Malaysia’s. To her, the Malaysian ‘model’ practises ‘discriminatory policies favouring one group over others’, while Singapore has ‘a system of equity based on merit’. Thus we’re back to comparing Singapore’s ‘meritocracy’ versus Malaysia’s ‘affirmative action’ (although it is more correct to call this ‘ameliorative action’). I am not a big fan of Malaysia’s National Economic Policy, which was instituted in 1971 as a means to allow Malays a greater economic stake in the country (at that time, they held around 4% of the economy—the rest of it was controlled by Chinese and foreign interests). This discrepancy was due to a colonial divide-and-rule policy: political power for the Malays, economic power for the Chinese. It is clearly an unfair policy, but it has to be examined in terms of what it aims to achieve: an equality of outcome. The idea is for Malays to be given extra state support such that they will feel as if they have an equal share in the country. However, the initial socialist goals of the NEP were gradually abused over time, taking on a communalist character. Eventually, it ended up narrowly benefiting an elite class known as ‘Umnoputras’ more concerned with feathering their own nests than the alleviation of the Malay poor. On the other hand, meritocracy is premised on equality of opportunity. But it can sometimes lead to consequences that might be argued as unfair. It is no secret that the majority of government scholarship awardees come from affluent, middle-class backgrounds. This is because of the ‘unfair’ advantages they enjoy, often referred to as social capital; these include an English-speaking home environment and the means to afford private tuition. We tend to overlook that meritocracy, while based on egalitarian ideals, often produces elitist results. The debate over ‘meritocracy’ and ‘Malay special rights’ is therefore not one that can be reduced to which system is better. They have to be understood within the context of the societies which practice them, as well as contesting notions of what constitutes ‘equality’. Similarly, we have to be careful about the indices that we use to judge the ‘standard’ of multiculturalism in a country. There are many Malays in Malaysia who are against the NEP because it violates their notions of social justice. Malay politicians like Anwar Ibrahim have campaigned on a platform of abolishing the NEP and replacing it with a more equitable system. The lawyer who defended the right of Lina Joy to convert out of Islam is a Muslim — Malik Imtiaz Sarwar. In Malaysia, we have members of the majority speaking up for disenfranchised minorities—something unheard of in today’s Singapore. The watershed Malaysian election of 2008 revealed that many voters were actually crossing racial lines. In Singapore, the entrenched idea that voters only vote for their own race led to the formation of the Group Constituency Representative scheme, where minority candidates supposedly piggyback on the appeal of a Chinese candidate in a Chinese-majority ward (meaning all wards in Singapore) to get into Parliament. Cultural producers such as Yasmin Ahmad also provide a glimpse into the active conversations on race in Malaysia. The advertisements by the visionary director Yasmin Ahmad are a case in point. Yasmin’s work (Tan Hong Ming, How to spell Dinosaur, From Madrass) not only convinced me that Malaysia wasn’t a scary country ripped asunder by NEP-apartheid, but also made me wonder why we don’t make such vignettes celebrating our racial plurality in Singapore. This is a mystifying statement. I wonder if the PM said something similar to the Chinese community: “You have become different from Chinese in China, Taiwan, Hong Kong, Macau, Indonesia, Thailand or Malaysia.” But the subtext is of course the issue of Malay loyalty to the state. 44 years after Independence, the Malay community still finds that it has to demonstrate its willingness to defend the country in the event of armed conflict with neighbouring countries. Seen in this light, I shouldn’t be too hard on Khartini. There is something strategic in her renunciation of Malay Malaysians. One detects a hidden oath of allegiance in her exaggeration of differences: ‘Malay Malaysians and Singaporeans live in different political and social realities’. One could forgive the shoddy sociology, the simplistic us-vs-them posturing in her article. Ultimately, the fact that Malays in Singapore need to constantly defend their nationalist credentials says a lot more about Singapore’s multiculturalism than a corridor of neighbours who are Chinese, Malay, Indian—and perhaps Eurasian.